Hi there, my name is Fiona and I will be your 52 Quilters host this week. Many know me as @BendigoLioness or as Miss Amity’s “Hooman”. I live in Bendigo – the “Golden Heart of Victoria” (Australia) with my purr-child Amity. In my former life I worked for over 20-years in the Australian Travel Industry. I owned & managed my own Travel Agency until I was forced to medically retire in 2010 following my diagnosis with ME/CFS (Myalgic Encephalomyelitis/Chronic Fatigue Syndrome) and later Fibromyalgia. It took me 3-years to find my niche after “retiring” from the work force. I experimented with many different hobbies until I started quilting in June/July 2013 after my mother gave me a vintage Elna Supermatic. I took to it like a fish to water. I have since upgraded to a modern Elna and a Janome. I guess you could say that I am self taught. When I got my first sewing machine, I googled information on sewing and quilting and enrolled in a free online Craftsy class and slowly plodded, bungled and muddled my way through as I learnt to sew. 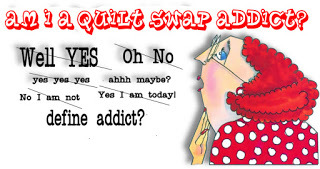 In the early days I joined a number of quilting bees via “Quilt Club Australia” on Facebook which helped me connect with some other quilters and to gain more experience. Over time I started to meet various quilters on Instagram and have been totally embraced within the Instagram community. 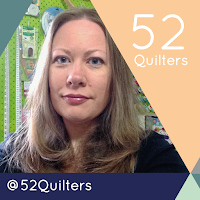 There is a massive sense of community especially on Instagram within the quilting community. Whatever hour of the day or night there is ALWAYS someone online SOMEWHERE around the world so even if at 3am in the morning you feel like a chat or need advice on a sewing matter SOMEONE is out there. Last year I also participated in a number of Quilt Swaps via Instagram which was a great way to experiment with different colour schemes and to work out of my comfort zone. This has also helped me to learn many new techniques and my skills have developed and improved. I'm looking forward to sharing my week with you and showing you some of my work. I am usually quite active on Instagram and I am hoping to share quite a few short blog articles with you. 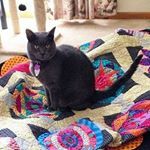 During the week I will discuss how my health affects me, and how quilting provides the therapy that I need to cope with living with Chronic Illness. I will introduce you to some of the wonderful local Australian designers who inspire me. I'm looking forward to showing you Bendigo and telling you about my visit to this year’s “Craft Alive” Expo; as well as showing you some of my favourite quilty hang-outs. And of course we can spend some time together sewing!